Whether you are running on a track, a treadmill or on the road, the number one consideration should always be courtesy. You wouldn't think of invading someone's personal space in everyday life, so just because you are wearing your exercise gear and a pair of shoes, why should things be any different? Let's start with the basics on the track - it's all about lane discipline. During practice sessions, the facilities are there for all, irrespective of individual abilities. So even if you are completing 400-metre laps with ease, don't think it gives you the right to barge past others or overtake them and cut them up by immediately stepping across their stride. Equally, those of more modest ability should be aware of what is happening around them so if there is a faster runner approaching from the rear, move away from the inside lane to allow them to pass. And when you have completed your running, step off the track immediately. Do not loiter, thereby presenting an obstruction to those moving at speed who quite rightly do not want to be side stepping “pedestrians' unnecessarily. In terms of race running, the organisers should always make competitors aware of a few basics. 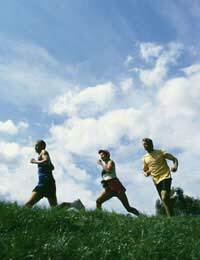 For example, do not run too closely behind another individual because there is the danger you will clip their heels with possible serious consequences both in terms of their participation in the race and injury. In the event of unavoidable contact, ensure that you signal to the other runner that you are sorry, even if it wasn't your fault. Anger and resentment between competitors during the race not only ruins the enjoyment of the event but impedes performance because the mind is filled with negative thoughts rather than the positivity needed to perform to the maximum. If water breaks are built into the schedule and you are not taking advantage of refreshments at an approaching station, plan to give the area a wide berth so that you are not interfering with those reaching out for a drink. When running on the treadmill, try not to disturb fellow gym users by exaggerated breathing techniques or grunting. Yes, you're aiming to get the maximum out of your body but that doesn't mean the person next to you has to listen to it. On the road, remember that the pavement is not your personal highway. There are bound to be others who want to use it simply for walking. And some of them may be older people, children or parents with push-chairs. Rather than run in a world of your own, look ahead and plan ahead. If there are people on the pavement, aim to move to the right or left to pass with plenty of space. If this necessitates stepping onto the road, remember to take a glance over your shoulder to ensure there isn't any oncoming traffic. Not only do cars represent possible danger, but also you can be a menace to them if you step out in front of them, causing them to swerve and possibly collide with another vehicle. It all comes back to courtesy. If you run a similar road route on a regular basis at the same time of day, it is likely you may be passing the same people. So building up a good relationship, if only in terms of eye contact, can pay dividends. Antagonise them with your rudeness and they are going to be less than co-operative when you need some space in which to pass.